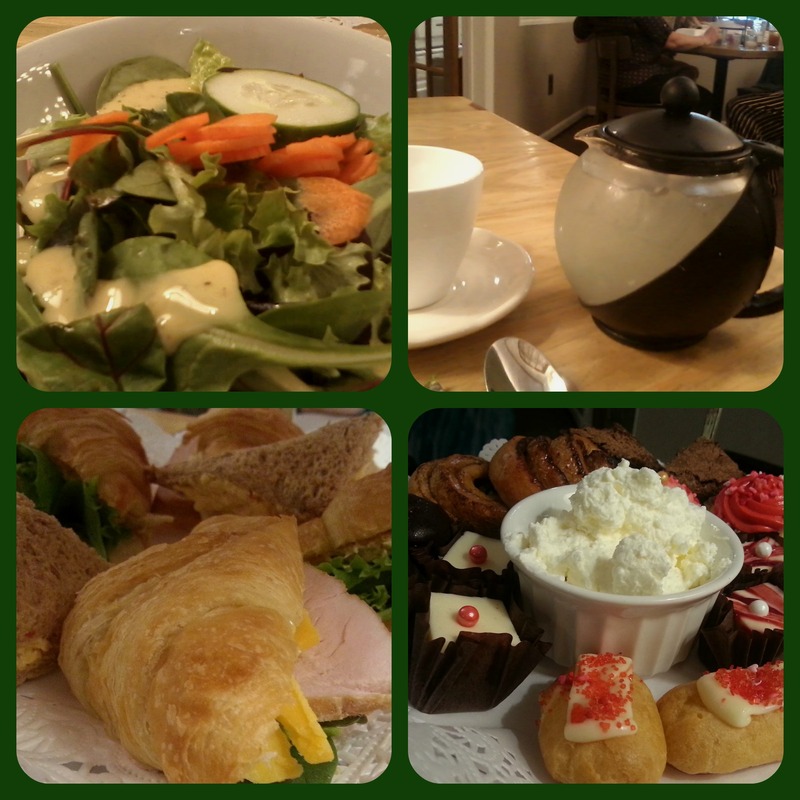 My latest afternoon tea experience took me to the Sugar Magnolia Café, located in the heart of the historic district of downtown Wake Forest. The location of this café is actually the premises of the former Olde English Tea Room (which closed its doors in December 2016), so I was curious to check out this new experience. The first thing that struck me was that Sugar Magnolia is more than just a café offering afternoon tea – there is artwork from more than 35 artists and artisans displayed on premises, and the slogan for the café is “come for the tea, stay for the art and shopping.” So this is really a full afternoon tea experience that you can combine with a leisurely walk around historic downtown Wake Forest. You might even walk away with a new piece of art for your kitchen or a vintage gift for a friend! The “Magnolia Tea” is a nice casual afternoon tea for $22 (they include an 18% tip on the bill) that’s offered after 2:00 pm on weekends. It starts with a garden salad with homemade dressing, and then the tiered plate arrives with a choice of three different sandwiches: a pimento tea sandwich (2 per person), a thick-sliced turkey sandwich with cheese on a lightly toasted croissant, and a chicken salad sandwich on a lightly toasted croissant (toasting the croissant makes an amazing difference). And, of course, you can’t forget about the wonderful desserts at Sugar Magnolia Café. These include brownies, cheesecake bites, mini-cream puffs (one chocolate covered) and mini-cupcakes. One interesting note here is that instead of scones, they offer cinnamon rolls (baked in-house) with Devonshire cream. Afternoon tea traditionalists might be a bit puzzled here – What is afternoon tea without scones? But this actually turned out to be a good choice – the cinnamon rolls were incredibly good and made the whole tea experience unique. Overall, Sugar Magnolia Café offers a good tea selection. My friend chose a cherry green tea that she enjoyed. It was a warm day so I went with their lemonade (a very good choice! ), and they brought the lemonade in a teapot (a nice little touch). It’s easy to see how the Sugar Magnolia Café could become a fun place to host mini-parties or events, mostly because of the surrounding ambiance. In addition to the classic “Magnolia Tea,” the café offers a half-price “De-Lightful Tea” for just $12.50, as well as a Birthday Tea Party option and something for the little ones called Teddybear Tea (as I understand it, if your child brings in a toy bear, they will set up a little tea or lemonade table for the two of them). When we visited, the owner waited on us and was very pleasant and fun to talk to. It’s nice to support these types of small, independent businesses and Sugar Magnolia Café is definitely a reason to visit downtown Wake Forest. Based on the overall experience and the excellent sandwiches and sweets included, this is an afternoon tea location I am putting on my list to return to in the near future. Thank you for sharing, in case you are capable of gift the core of what you've got truly experienced within the writing you do, it's far obtrusive which you have become an expert in essay writing.